Introducing the co-chairs and inspiration behind Digital Skills for Women! Digital Skills for Women is a learning cohort created by women for women aimed at female professionals who do not have experience in the tech/digital/IT industry. The curriculum for each cohort will be slightly different based on the feedback we get from the applications. We’ll be bringing in women experts to lead each session (find more details on the Digital Skills for Women program). We’d like to take this opportunity to introduce the co-chairs of the program and the story behind how it all started. 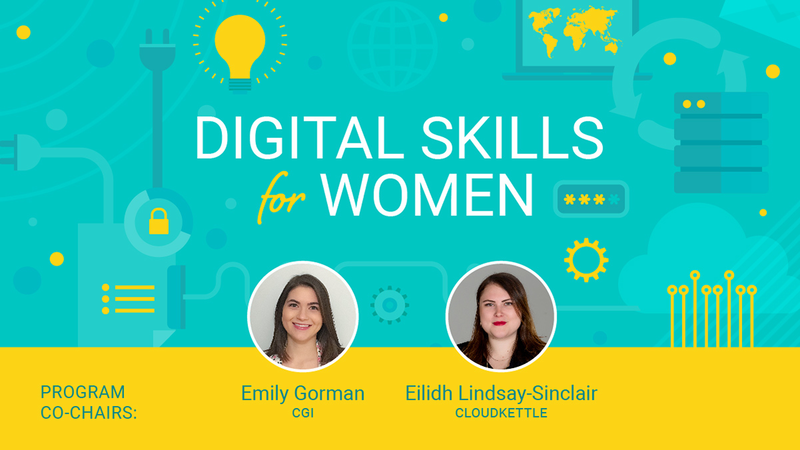 The co-chairs for Digital Skills for Women are Emily Gorman and Eilidh Lindsay-Sinclair. Emily Gorman holds a Marketing degree and Human Resources certificate from Saint Mary’s University and Business Analyst certifications from Dalhousie University and the International Institute of Business Analysis. She started her career in human resources before going to work for digital and marketing agencies and is now a Business Analyst Consultant at CGI. Eilidh Lindsay-Sinclair grew up primarily in China and over the years has had a number of small entrepreneurial ventures, most notably a wholesale jewelry company. She then completed her Public Relations degree at Mount Saint Vincent University before becoming employee number one at a local consultancy; CloudKettle. Today, Eilidh serves as CloudKettle’s Director, Operations. Where did the idea for Digital Skills for Women come from? Eilidh: About a month ago I was attending a virtual workshop called #IAmRemarkable. A Google initiative, it was developed to empower women and underrepresented groups to speak openly about their accomplishments. During the workshop, they talked about how women will only apply to jobs they meet 100% of the requirements for. Comparatively, men will apply for roles they meet 60% of the requirements. I thought about the findings of that study and wondered if women were also more likely to bow out of a conversation, opportunity, etc. because they didn’t understand all the language. Then I thought back to when I interviewed with CloudKettle. I was introduced to Greg, the founder of CloudKettle, through a previous boss of mine. The night before the interview I sat down to read CloudKettle’s website. Unfamiliar and intimidated by the language on the site I thought “I can’t go to this meeting and waste this guy’s time.” I looked over at the clock and realized it was already 11:00 PM – too late to cancel. In the end, I showed up to the interview, got the job and that’s how I fell into the technology industry. Not everyone is as lucky to have the same experience. Shortly after completing the #IAmRemarkable training, I met Emily for coffee and quickly the idea for Digital Skills for Women began to come together. Emily instantly related to what I shared and held similar experiences. We set out to create a program to address a gap in the Halifax tech job market that we’ve experienced ourselves. Two weeks later we launched the application for Digital Skills for Women. Why do you think Digital Skills for Women is important? Emily: We started Digital Skills for Women as a result of our own experiences entering the digital/tech industry. Neither of us had access to a program like this, so we’re creating one that we wish we had. All in hopes that women in our local community will be more confident and better positioned for success in their own transitions into the tech industry – to have the foundation Eilidh and I would have loved to have when we started out. My story is the one that we hear all the time about a woman not applying for a role in the digital/tech industry because she doesn’t check off all of the boxes on the job description. I knew I wanted to be working in the digital space, but my work experience was in human resources and I had no clue where to start. It took me two years to build up the confidence to apply for digital roles. When I got offered a job at a digital agency, I went from not knowing what a CMS was to being a key digital resource on website projects in under two years. I’ve been lucky to have absolutely phenomenal female mentors and sponsors along the way who continue to help me navigate the digital/tech landscape, but not everyone does. The Digital Skills for Women program is important because it will introduce a variety of tech-related topics to the women that they can then use to start identifying what areas they’re interested (or not) in. The purpose of the program is to help provide participants with a foundation that they can build on, but also to introduce them to women who have a similar desire to learn more about digital/tech. It’s important to us that at the end of the cohort, the women feel more confident in exploring (and applying for) roles in the tech industry or taking on more digital roles within their current companies. What types of considerations did you make when creating this cohort? The language in the blog post and application is relatable to beginners. The location where Volta Labs is, is wheelchair accessible. When considering venues it had to be convenient. Volta Labs is accessible via many major bus routes. Once accepted as a Digital Skills for Women cohort member, those requiring travel assistance may obtain Metro Transit tickets by emailing info@cloudkettle.com. The timing of the sessions was based on feedback we got from the community on when childcare would be easiest to secure. We’re also asking all applicants to indicate if they have dependents for planning purposes for future cohorts. Our goal is to have each session led by an experienced female instructor. Limit the class size to 10 participants so the group is small enough to facilitate meaningful conversations and learning. Research shows women are more likely to attend women-only training programs which is why it was decided to only accept applicants that identify as women. Emily: From my perspective, one of the biggest challenges we face is being able to cater to the vast audience we’ve received applications from. We want to make sure we pick the right group. To us, this means a diverse group of women in each cohort who will ask plenty of questions and demonstrate a willingness to learn. But we also want to make sure that we give them the right content – content that will allow them to look at things differently, spark curiosity to explore things further and be valuable in establishing that foundation. As part of this challenge, we need to acknowledge (with the applicants and ourselves) that Digital Skills for Women can’t accept everyone. We’ve limited the cohort to accept only 10 women at a time because we believe that this will provide a better learning environment and allow the participants to build stronger connections with each other and the instructors. But it also means that we will not be able to accept everyone who applies. We don’t want the women who don’t get accepted to be discouraged – in fact, we encourage them to apply again when we open applications for future cohorts. If you’re interested in learning more about the cohort, check out the details about the Digital Skills for Women program. The deadline to apply for the first cohort is Friday, November 30.